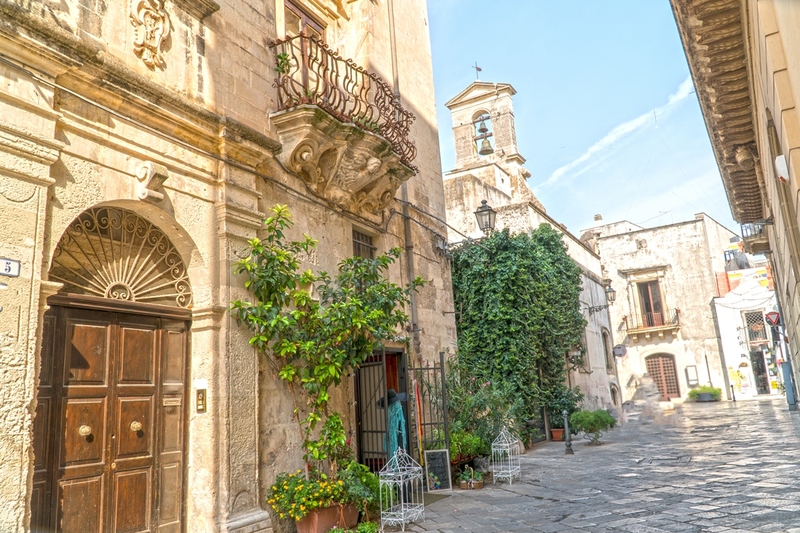 Comfortable walking shoes and a curious mind are all you need to discover the marvels of Galatina: Medieval lanes and magnificent squares, the ancient stone streets of the historical center are all corridors and salons of an open air museum, illuminated by sunlight or the languid rays of the moon. Galatina is an artist’s canvas: amber brush strokes fill your gaze, the Baroque churches are treasure troves of captivating tones and nuances, the gold of the ceilings and ornaments alternating with the rich colors overflowing from the paintings of illustrious masters. The warm, sand tones of Lecce stone, “pietra leccese”, harmonize with the mystical red of the “tarantate” women, dancing in frenetic, religious trance as they worship San Paolo, moving to the hypnotic beat of the “tamburelli”. Music fills the streets in an irresistible blend of joy and sadness, rhythm and rest, floating through the imposing arched entryways of the “portali di Galatina”: sculptured and embossed arches which frame the homes of the local philosophers, sculptors, craftsmen and members of parliament, architectural marvels that have become landmarks of a city admired throughout Southern Italy. The history of Galatina is told, at least in part, by the emblem of the city. Firstly, by the owl in the lower part of the emblem, sacred to the goddess Minerva, the divinity to whom Galatina was originally dedicated, in the era when the city a colony of ancient Greece. To contrast the practice of Byzantine rites and the remaining influence of Greek culture, which remained an active presence in the city until the XVI century, Pope Urbano VI chose Galatina as the central hub of Latin culture in Southern Italy, bestowing the city with the Papal Keys, which are represented at the top of the emblem. The emblem of Galatina recounts the cultural dualism animating the city throughout the Medieval period, ending only when Charles Angiers relegated the feudal territory to the De Balzo lineage, which then went by succession to Count Raimondello Orsini Del Balzo. During this period, Galatina continued to expand and needed new city walls. 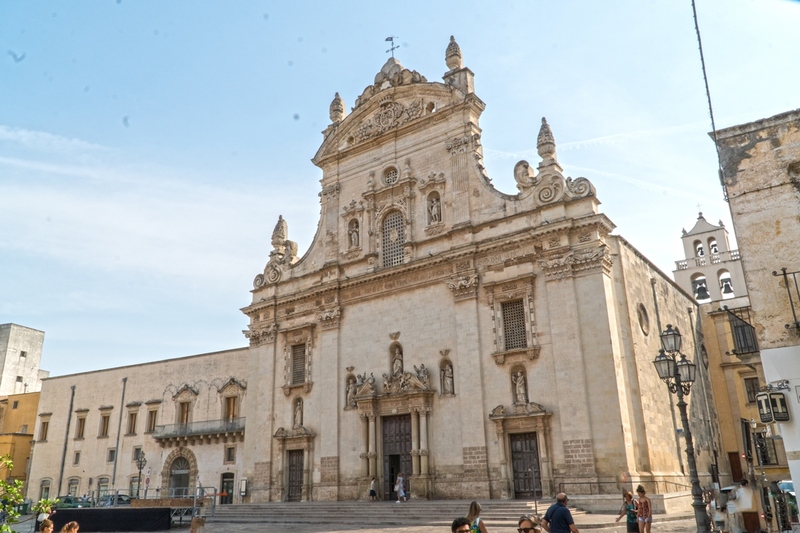 The Church of Santa Caterina of Alessandria was constructed, as well as the ancient hospital and the Orsiniano Monastery. Upon the death of the last Orsini De Balzo heir, the city had become so large as to receive the title of Dukedom, and was thus assigned to the Castriota Scanderbeg family. The excessive taxes levied on the population made the dukes unpopular, but regardless of the oppression they imposed on their citizens, to their credit, the Scanderbegs did build the Castle of Galatina, which became a dynamic driving force of culture for the city. 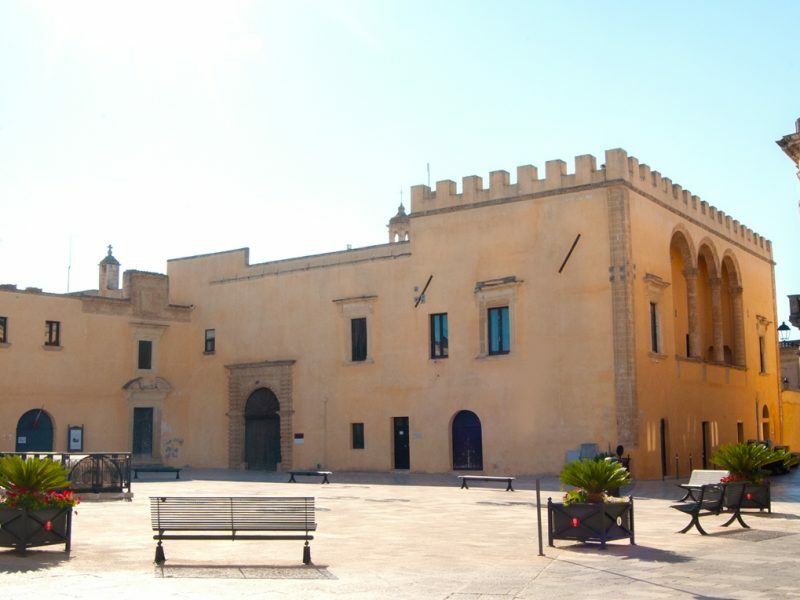 Writers, philosophers, painters and sculptors frequented the Ducal palace, winning Galatina the fame of being the most important “Citta’ d’Arte” (City of Art) in Southern Italy. 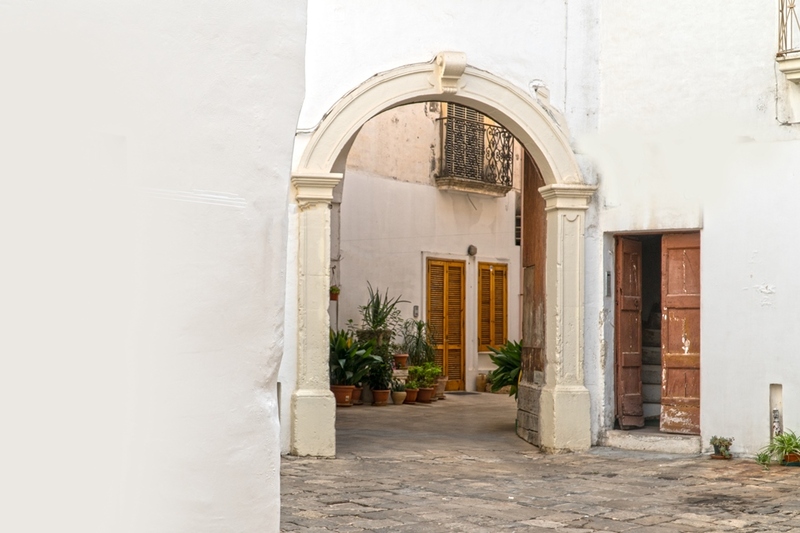 Galatina has conserved all her cultural treasures, and today generously shares the art and knowledge accumulated over the centuries with her next generation of visitors. 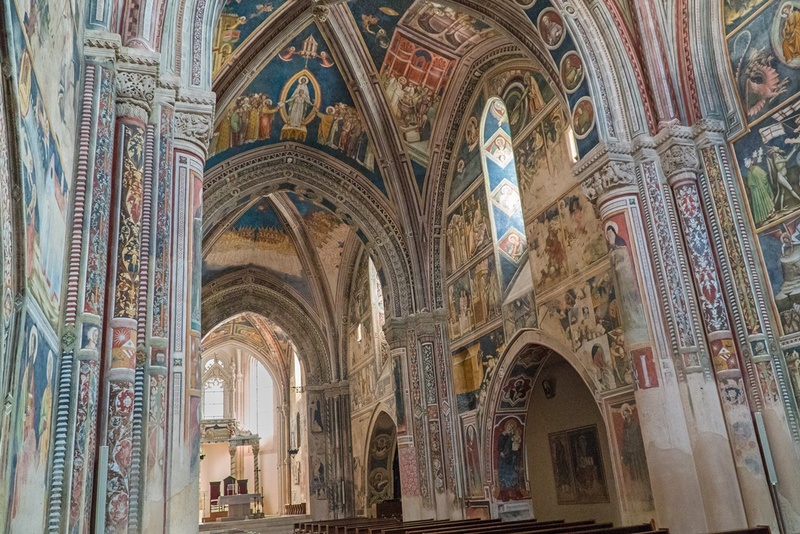 The Basilica of Santa Caterina d’Alessandria is the most important monument in Galatina. 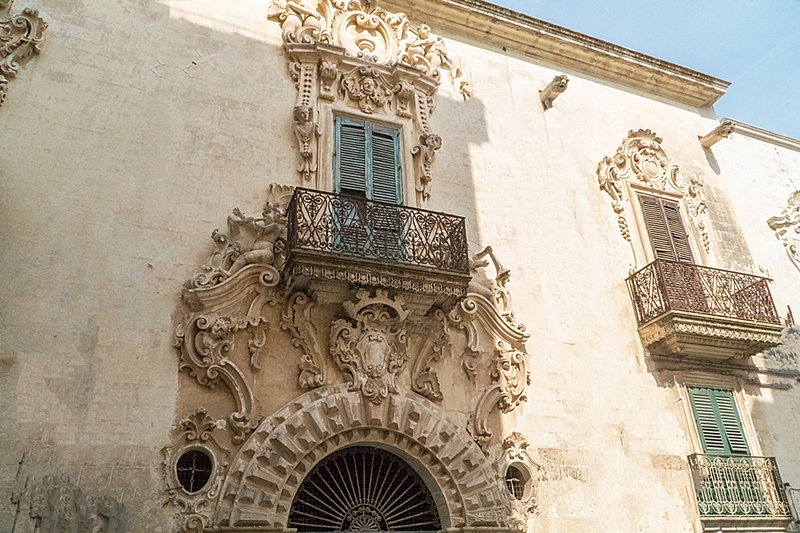 The façade is in Romanic Pugliese style, with austere features graced by unexpected decorative elements and figures carved in the stone exterior. 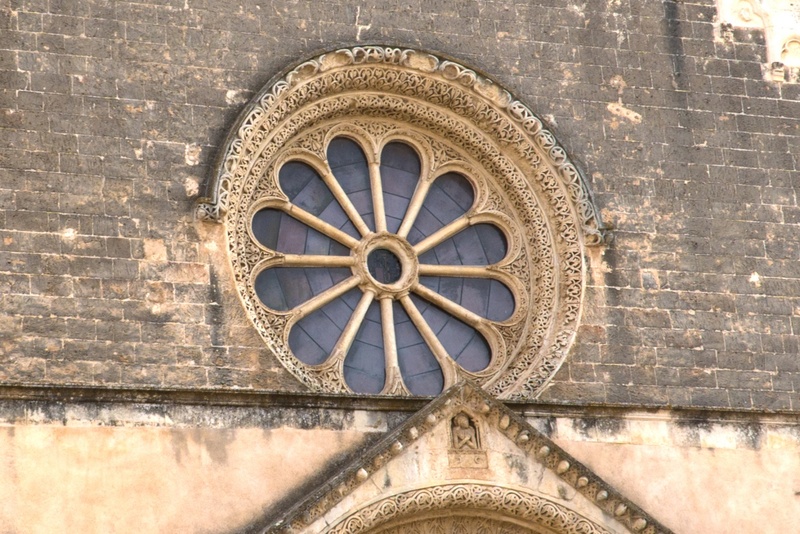 The rose window is exceptionally high, with fluid, simple lines, giving a sense of aesthetic completion to the façade. The exterior exudes a sober elegance, with architectural elements typical to the territory. Once inside however, you find yourself in another world, far from the traditional Pugliese style. The somber façade contrasts with a breathtaking interior that seems to transport you directly into the Basilica of St Frances of Assisi. Frescos are literally everywhere, and so rich in detail that they seem to take you by the hand and lead you into the stories they recount. On high, we see the construction of the Tower of Babel, step by step, illustrating all the ancient tools and instruments utilized at the time. Further along, we encounter Adam and Eve as they are eating the forbidden fruit, which is not an apple, but instead, a date, a more Mediterranean choice. 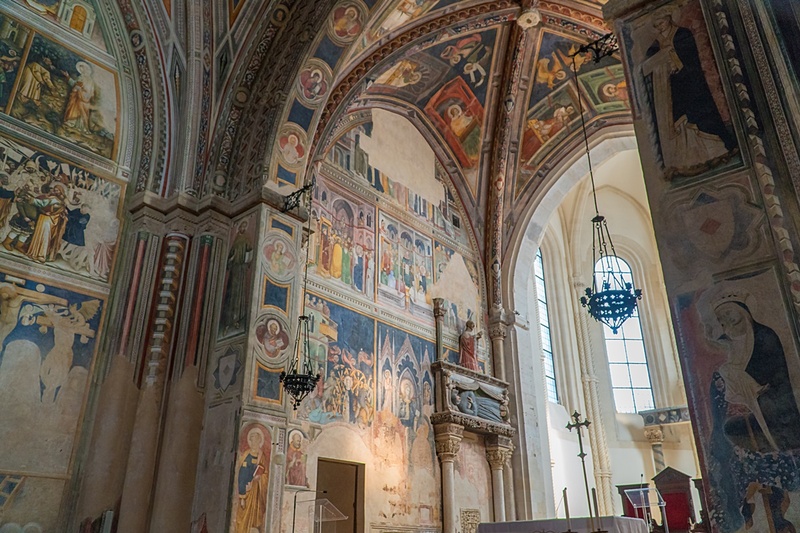 The frescos on the upper vaults tell the story of the life of Jesus, of St Catherine, Genesis, the Apocalypse…the entire Bible has been illustrated on these walls. 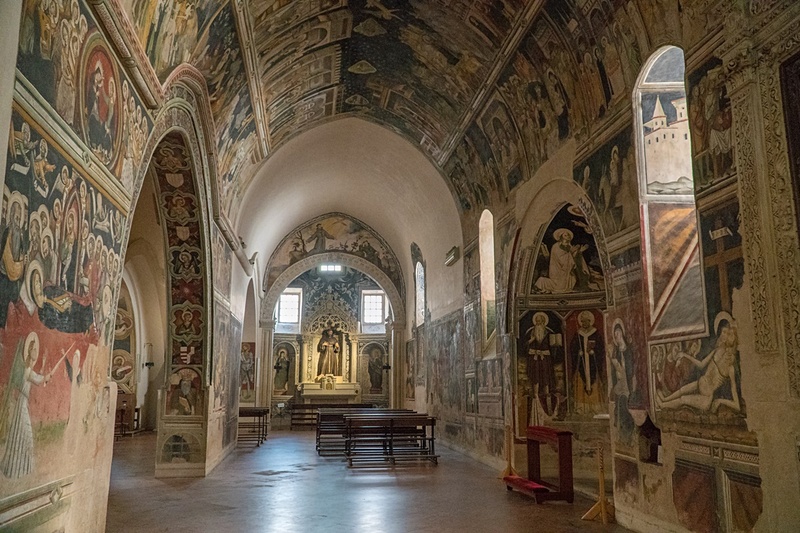 These frescos had a specific educational function, as during the Middle Ages most of the population was illiterate, leaving the task of teaching the Word entrusted to the frescos and paintings in the churches. Who exactly designed this all-encompassing marvel remains unknown, but given the wide range of styles, such as Giotto-style features, with some designs executed without prospective, and others with highly developed depth and realism, it is thought that the frescos were created by many different painters from all around Italy. 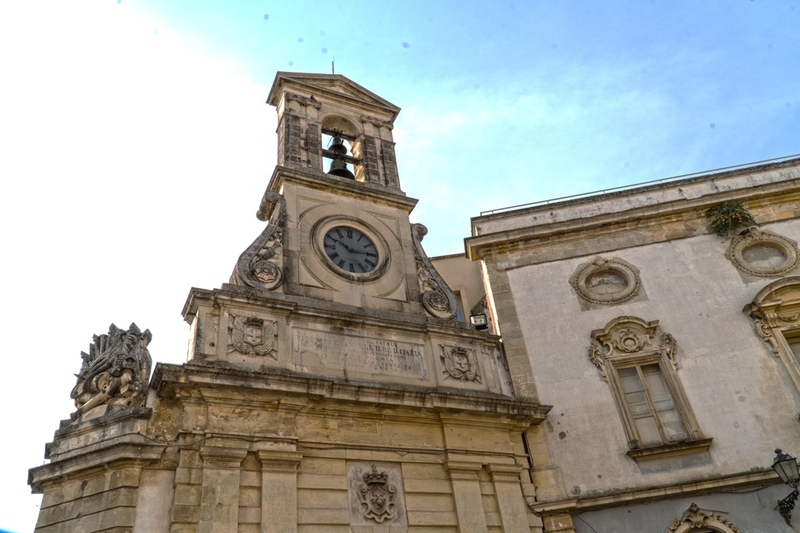 The Cathedral of Galatina is a Baroque church facing Piazza Orsini. When, exactly, the work on its construction began is not certain, but it probably dates back to the first half of the XIV century. 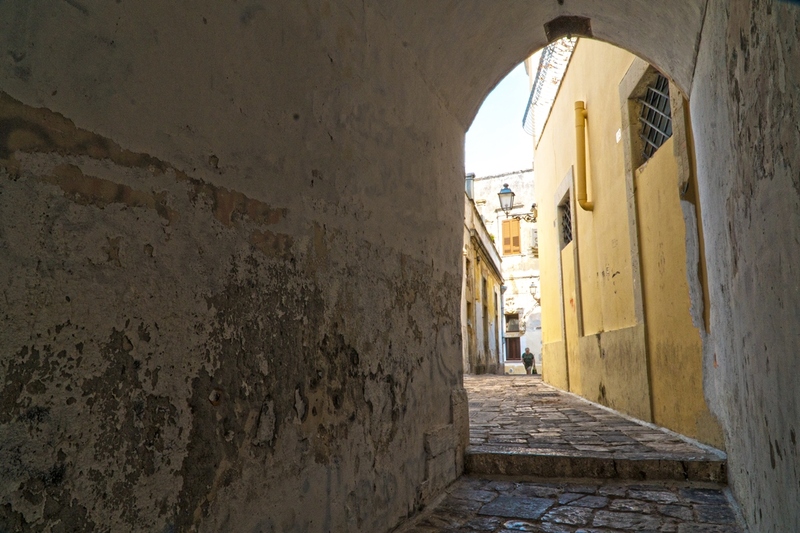 Over the centuries, negligence and neglect caused serious deterioration to the structure, and it underwent reconstruction between 1621 and 1633. A terrible earthquake in 1743 damaged it again, making another restoration necessary. 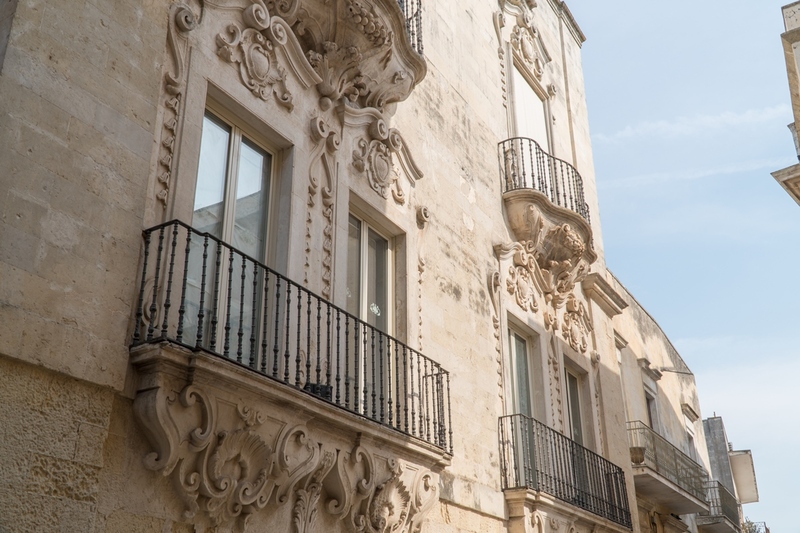 The façade is in Lecce stone, and the main entrance is flanked by four columns, two on each side, supporting an elegant architrave. 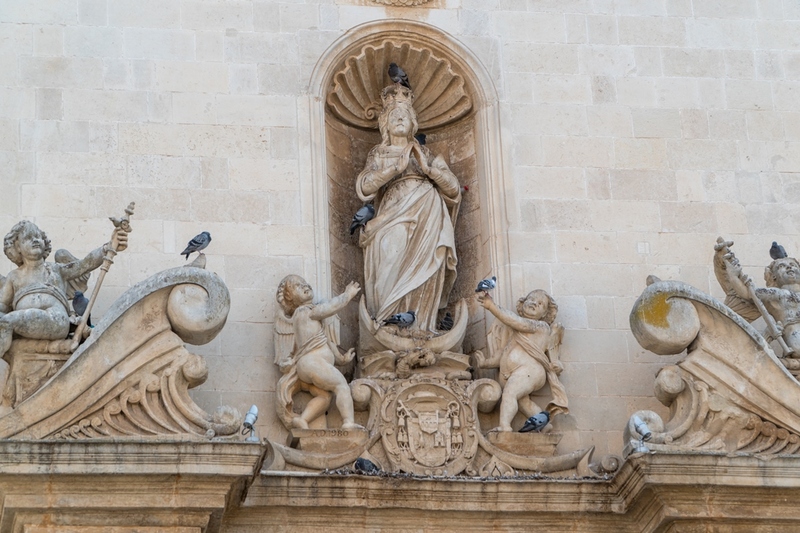 Above this, a statue of the Immaculate Conception presides, framed in a gracious niche and surrounded by other saints, among them, St. Peter and St. Paul. This iconography encourages the supposition that the church was originally dedicated to the Virgin Mary. 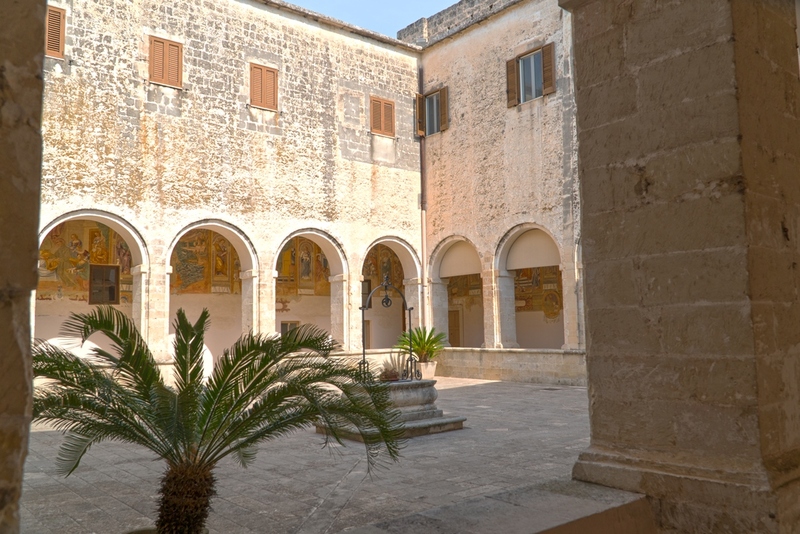 The interior has three naves and is graced by an exceptionally large collection of sacred art, such as the paintings decorating the vestry, and the frescoed ceilings, created by the Neopolitan, Vincenzo Paliotti, The polychrome marble alters are also Neopolitan. There is one particularly exceptional piece in the vast artistic patrimony of this church: the magnificent silver bust of St. Peter. 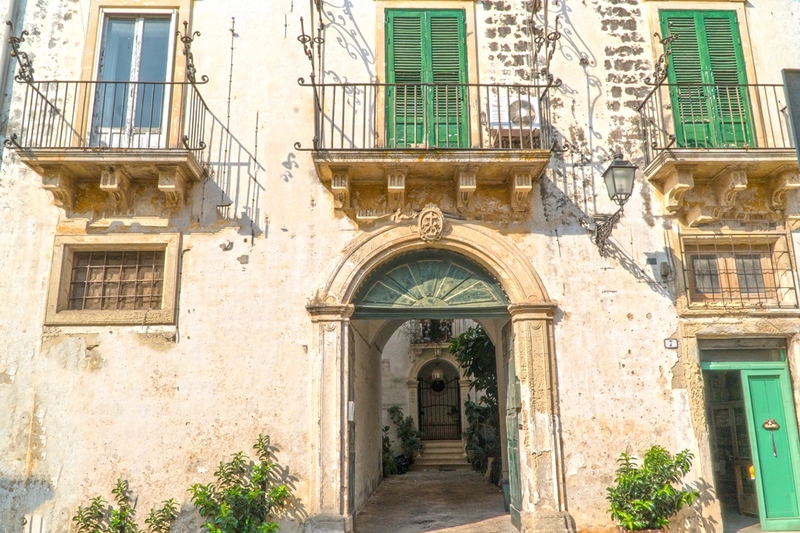 Palazzo Tondi is found near the Cathedral of Galatina. This prestigious noble residence is the custodian of an important piece of the city’s history: “la Cappella di San Paolo”, the Chapel of St. Paul. It is said that during their voyage of evangelism, St. Peter and St. Paul came through Galatina. St Paul was offered hospitality by a “pio galatinese”’, a pious citizen of Galatina, and to repay his generosity, St Paul gave the man and his descendents the power to heal whoever was bitten by the tarantula. As you walk the fine line dividing the sacred from the profane, and legend from truth, you arrive at Via Garibaldi, number 7, where you will find a simple whitewashed chapel. 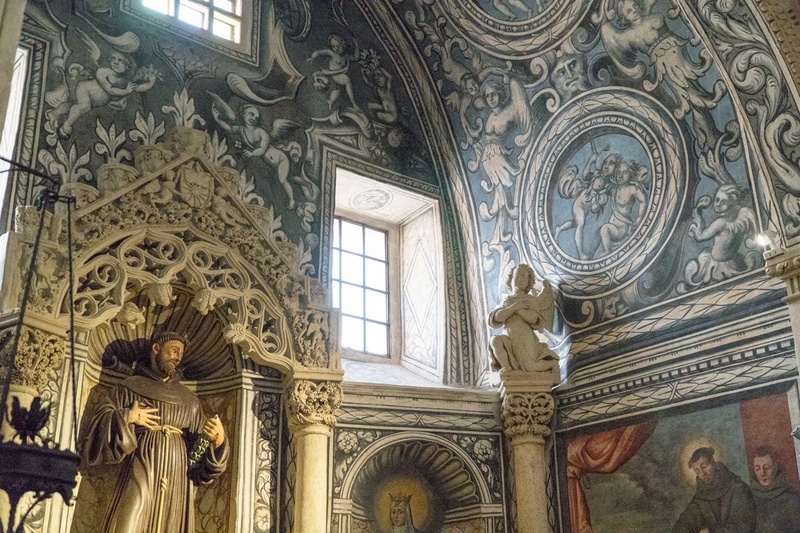 Inside, there is a Baroque altar, and above it a painting by Francesco Saverio Lillo, depicting St. Paul with a sword in his hand, a man, a woman, and an angel holding a book. Next to the chapel is an ancient well, where the people bitten by the tarantula, the “tarantate” would drink from its waters to be healed. From the Middle Ages until the 1950’s, rites of purification were held in this chapel for women and also men suffering from the emotional, physical and psychological malaise attributed to the bite of the tarantula. Once the chapel was no longer used, it was left to its destiny, and the structure was slowly damaged over time. Only recently, the curiosity and appreciation for the culture of the “Taranta” and its ancient rites have brought a new life and luster to the “Capella di San Paolo”. 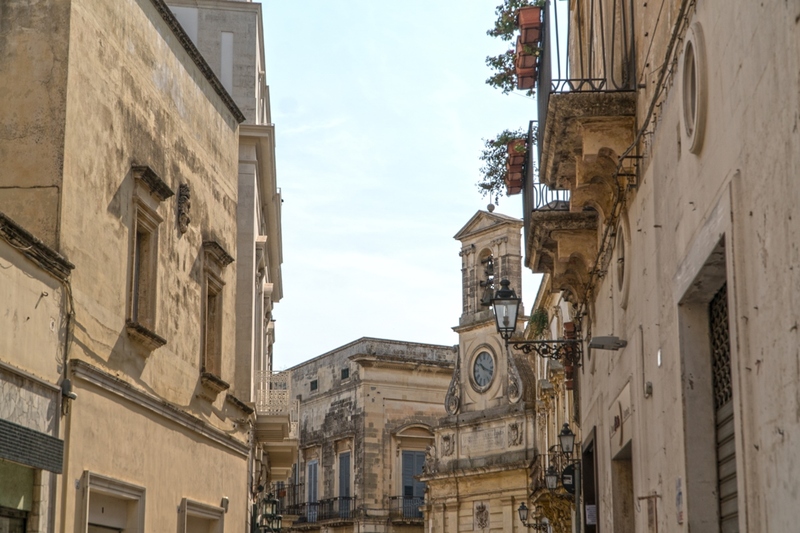 The historical center of Galatina has one of the richest cultural heritages in all Salento. Countless artistic treasures and architectural masterpieces are safeguarded within the ancient city walls, which were built around 1700. 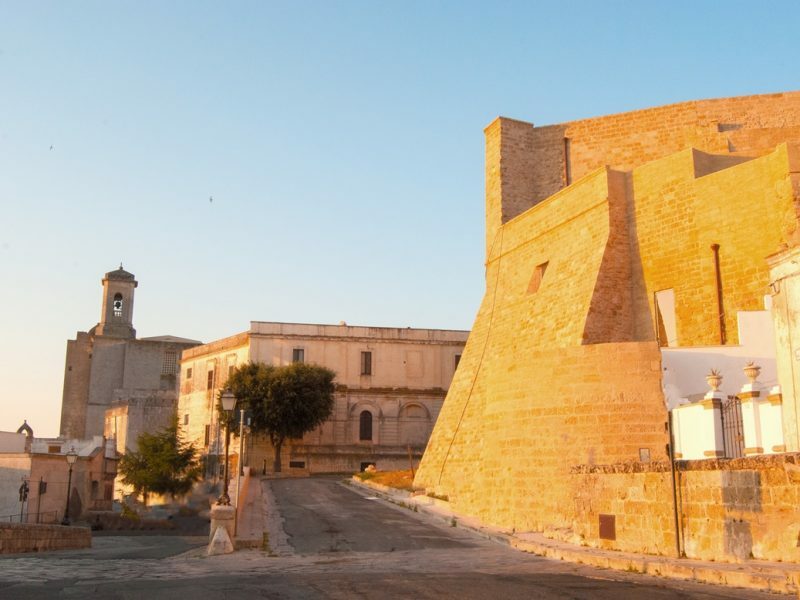 With Raimondello Orsini at the helm, Galatina became so extended that the historical center could be entered by five different gates. Today there remain only three. The first gate is Porta Cappuccini, so named because the Cappuccini monks passed through it on their way to their charitable institution, a monastery outside the city walls, Il Monte della Pietà. The second city gate is Porta San Pietro, displaying the emblem of the city and a statue of St Peter. 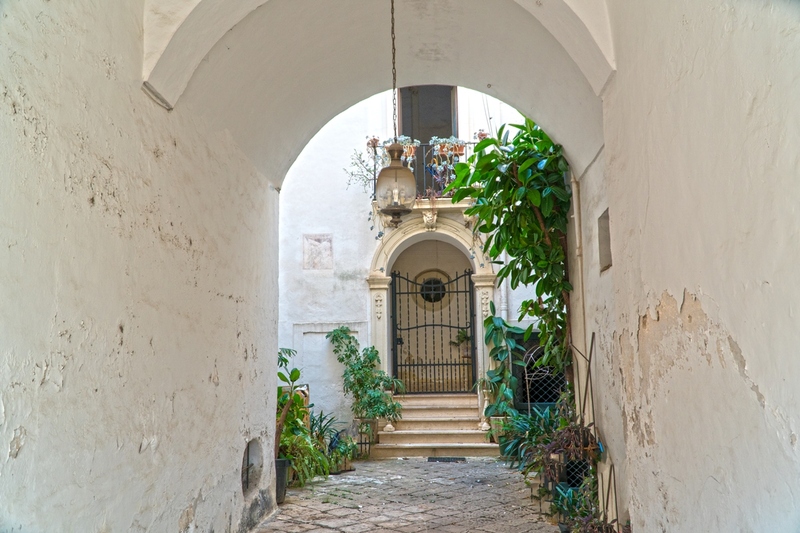 The third gate is Porta della Luce, (the Gate of Light) named for the nearby church, La Madonna della Luce. Legend has it that this church was constructed outside the walls by a thankful merchant who, returning to Galatina in a terrible storm, was guided to safety by a white light. Religion is intrinsically woven into the culture of Galatina, and it is overflowing with religious buildings and statues, all symbols reflecting the Pope’s desire to contrast the presence of Byzantine rites and Greek culture in the city. There are so many churches in Galatina that it would be almost impossible to describe them all. 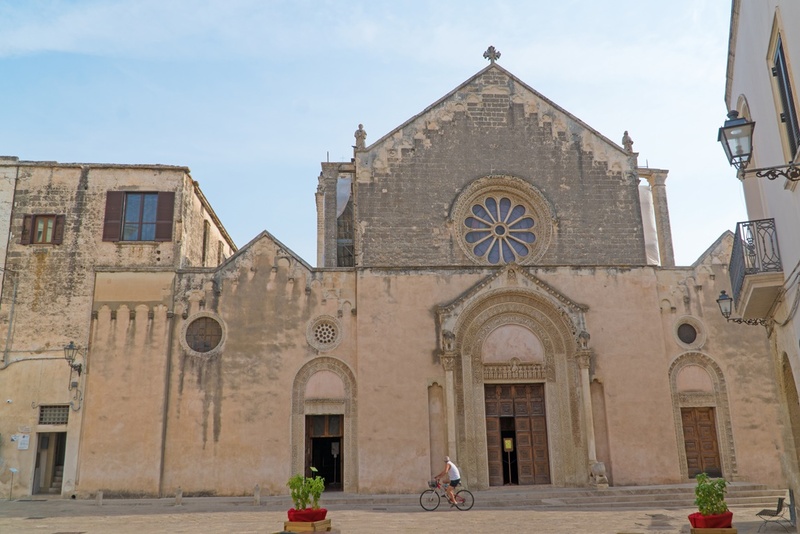 Certainly the most important is the main church, dedicated to the protectors of Galatina, St Peter and St Paul, built in elegant late Baroque style, with frescos recounting the life of St Peter. There are as many palaces and historical buildings as there are churches: Palazzo Orsini, residence of the Counts Orsini del Balzo, Palazzo Angelelli Dolce, Palazzo Congedo, il Sedile, the seat of the town hall, as well as the historical residences of philosophers and intellectuals, such as the home of Pietro Siciliani, where you can find an inscription signed by Giosuè Carducci. Collemeto is located on higher ground than the city, hence its name, based on “collina”, or hill, in Italian. 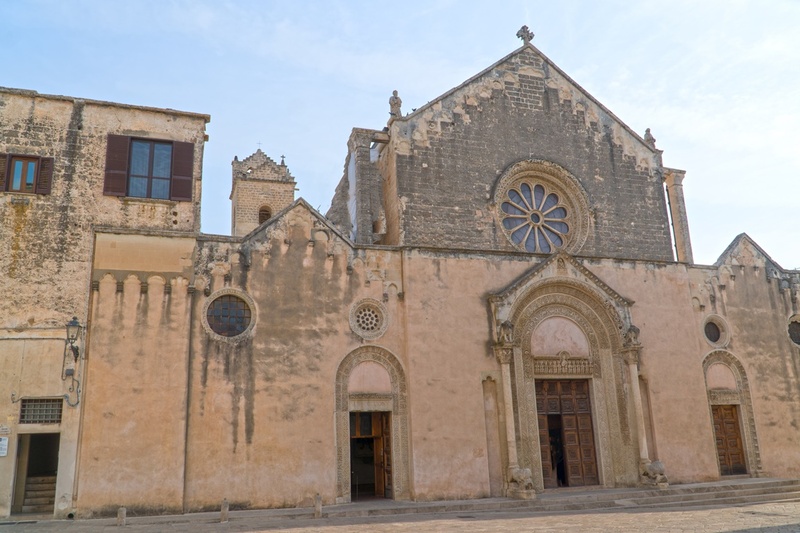 The village was built around an ancient abbey of Benedictine monks and remained a hub of Christianity until the Unification of Italy, when all ecclesiastical property was appropriated by the government. The urban center is surrounded by five masserias (fortified stone farms), which protected the inhabitants. 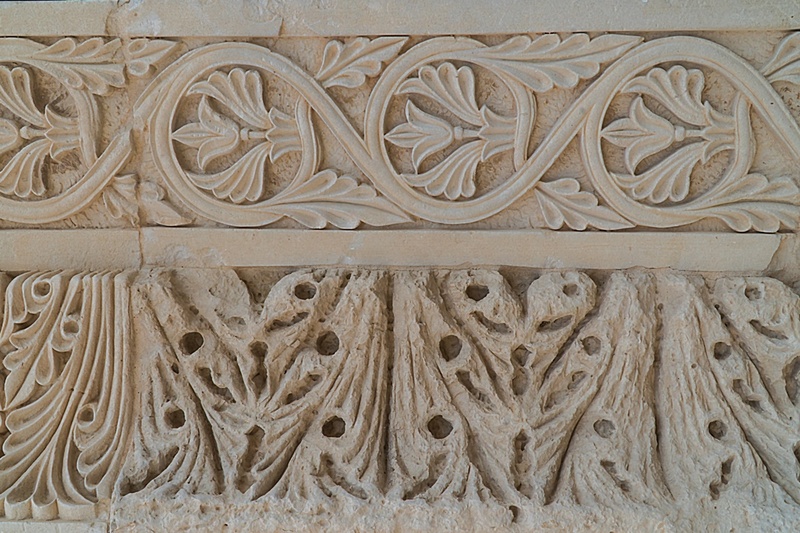 Noha is Galatina’s most ancient hamlet, as attested by the prehistoric relics found in the territory. 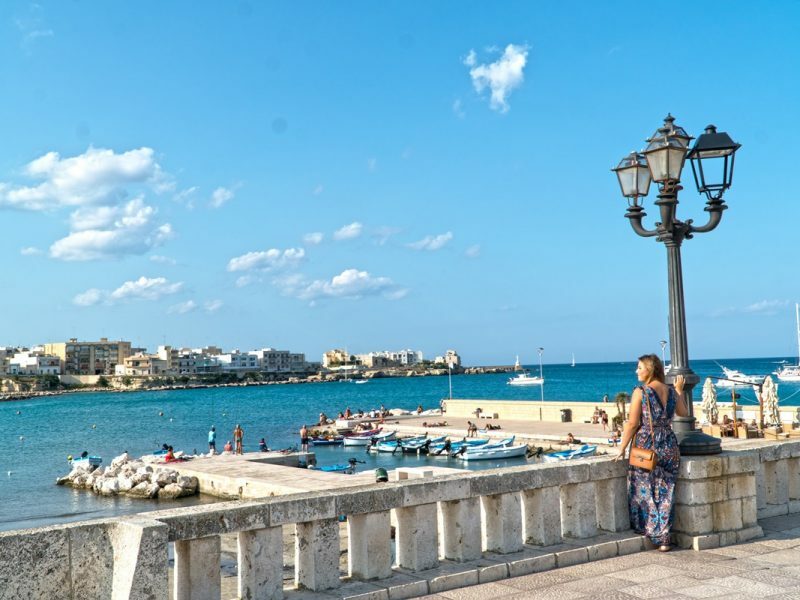 It is located on the ancient axis road that connected Galatina to Ugento, a route full of coastal towers and lookout posts; like Ugento, Galatina was originally a Messapian colony, which then became Greek, and then Roman. 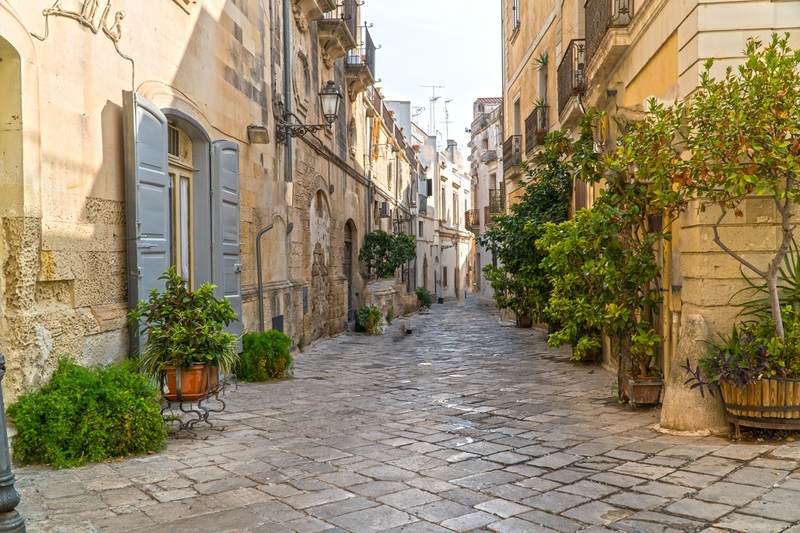 Santa Barbara developed as an urban center in the 1900’s around a masseria built in the 1500’s, located in a marsh area. We are in Galatina, no more than sixty years ago, and not some distant past. Today, “la Taranta” is the music of festivals and entertainment in Salento, but the notes of the ‘tamburelli’ were initially used for exorcism rites. Victims of tarantula bites, which caused an insistent, cyclical melancholy, were taken to the Chapel of San Paolo, where, under the painting of the saint, and hypnotized by the rhythmic tones of the “tamburelli”, they were cured in a mystical catharsis, reborn by the melody of “the Pizzica”. For centuries, Tarantismo has fascinated the curious minds of researchers and physicians, including Leonardo Da Vinci, and most importantly Ernesto De Martino, who in 1959, came to Galatina with a team of researchers to observe the “tarantate” women first hand, documenting his studies in the quintessential book on Tarantismo, “La terra del remorso”, the Land of Remorse. 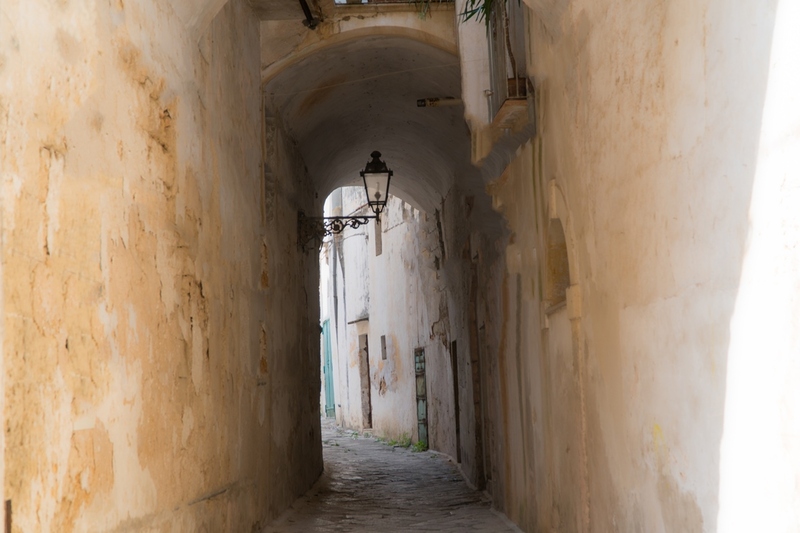 Today, tarantulas no longer bite the women under their long skirts as they toil in the fields, but the mystique of the phenomena, part legend, part fact, continues to resonate throughout the territory, and has become an important part of Salento’s musical heritage and culture. The Castriota Scanderbeg family were ancient nobility of Albanian origins. They arrived in Italy in the XVI century when Giovanni Scanderbeg fled Albania to seek support from the Kingdom of Naples. Ferdinando I, “The Catholic”, named him Count of Soleto, and later, Duke of Galatina. The citizens of Galatina were less than enthusiastic about the Ducal family, due to their propensity for heavy taxation. Nonetheless, to their credit, the Castriota Scanderbeg were patrons of the arts. 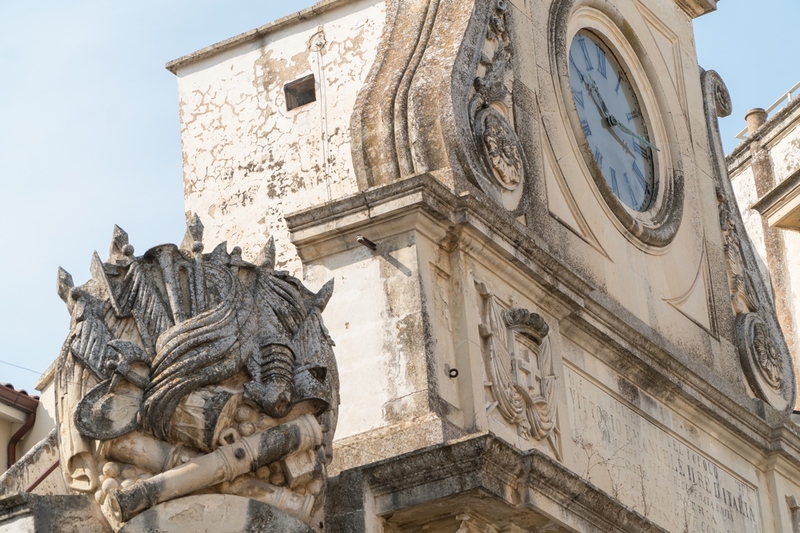 They constructed their palace on the ancient city walls, and it hosted the prestigious writers, artists and minds of the day, transforming Galatina into the pulsating heart of culture for the entire Salento region. Particular merit must be given to Ferrante Castriota Scanderbeg, son of Giovanni, who was the driving force behind this center of knowledge and art. Gioacchino Toma was one of the most important painters of the 1800’s. He was born in Galatina in 1836, but became an orphan at a tender age, and the loss of his parents deeply affected his entire life. In fact, his only literary work, which was inspired by his own life, is entitled, “Memoirs of an Orphan”. Gioacchino Toma moved to Naples in 1855, where he made his name as a painter, focusing on the art of still-life as his principal subject. In 1857, he became impassioned with the anti-Bourbon ideology fermenting throughout Italy, and later fought in the revolution at Garibaldi’s side. From 1861 onward, his paintings were strongly influenced by his patriotic ideals and political beliefs. Delicate light and an intimate atmosphere are the principle characteristics of his unique style. In 1878 he was nominated Professor at the ‘Accademia’ of Naples, and in 1879 he began to paint landscapes and portraits. He died in Naples in 1891. Born on August 5, 1968, Luigi Martinucci is ‘Gigi’ for everyone who knows him. A cinematographer with a long and illustrious career in cinema, he has also made short films and documentaries. 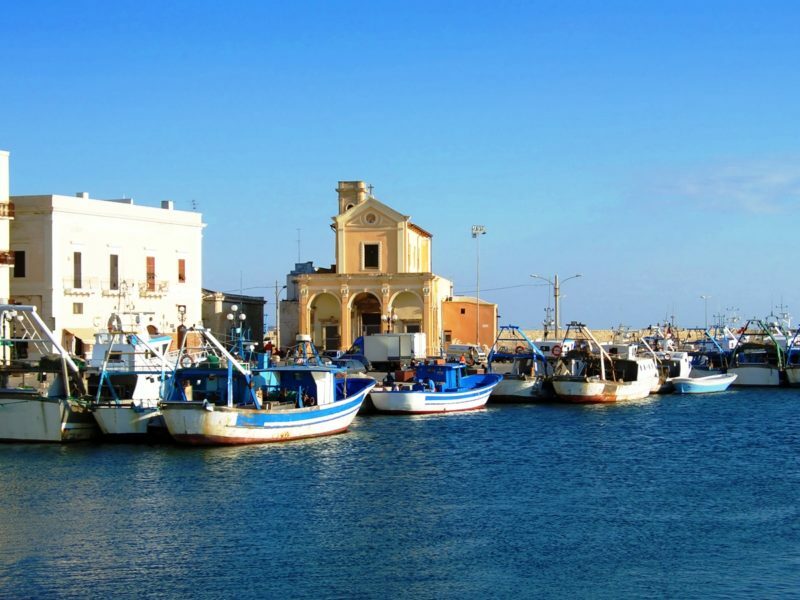 In Salento, there are people who rush to the airport cafe the moment they land at Brindisi airport, just to order a ‘pasticiotto’. Whether they have been away for a month or for a week, the best way to be welcomed home is that familiar delight of shortbread pastry and cream that melts in your mouth: ‘il pasticciotto’. There are people who rush out to their neighborhood café as soon as they wake up, because the day cannot begin without their coffee and ‘pasticciotto’. would become so popular, yet thanks to this fragrant treat, the Ascalone pastry shop still exists today, in the historical center of Galatina. It was the 29th of June, during the festivities for St. Peter and St. Paul. Pastry chef Andrea Ascalone realized he didn’t have enough pastry dough and cream to make another cake, so he decided to use the tiniest cake mould he had, and put in the remaining dough and cream, like a little treasure chest holding a pastry cream treasure inside. When he took it out of the oven, he was so disappointed with the result he exclaimed: “Che pasticcio!” What a disaster! Then he gave the pastry to a passerby, who liked it so much that he ordered more to take home to his family. 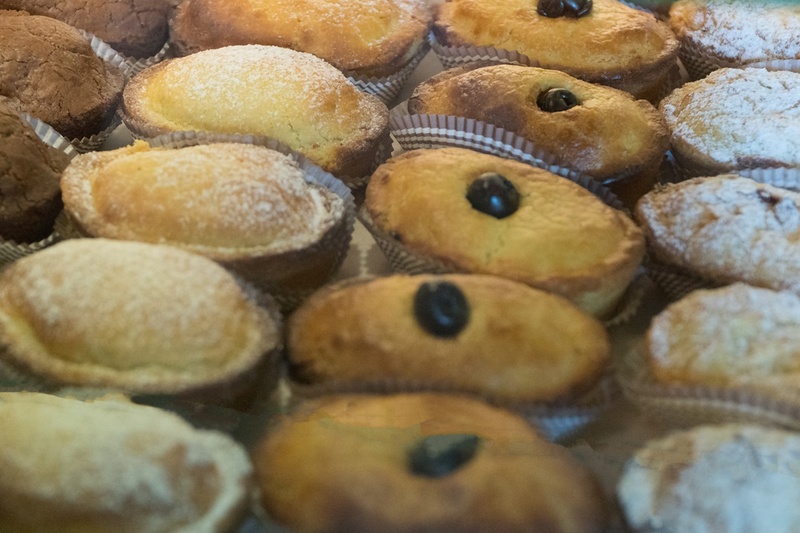 Today, “il pasticciotto”, the ‘little disaster’, is the emblematic pastry of Salento, and there is not one pastry shop in the region that does not produce it in myriad variations of fruit, cream, chocolate, and even a savory version. The secret of its success? Perhaps its simplicity, and certainly…because it’s delicious!